By Soni Cochran, Extension Associate, Lancaster Co.
February is a terrific time to get birdhouses built and ready for the spring breeding season. Birds will begin looking for nesting sites in March so houses should be placed outdoors in the next few weeks. You can attract birds by building an inexpensive, simple, six-sided box. “Backyard Wildlife: Birdhouses and Shelves” from Nebraska Extension has plans and nesting requirements for eighteen species of birds found in the state. Contact your local extension office for a copy of this publication or go to https://go.unl.edu/birdhouses. Wood is the best material to use for birdhouses and shelves. Do not use tin cans, milk cartons, or metal for nest boxes. Commercial martin houses made of aluminum are the only exception. When using wood, choose untreated and unpainted wood. According to the Cornell Lab of Ornithology, cedar, pine and cypress are good options. CDX exterior-grade plywood is a good choice for larger birdhouses. Do not use pressure-treated lumber. Wood sold as 1” thick provides proper insulation for birdhouses. The roof of a birdhouse helps keep out rain. When properly constructed, it also makes it harder for predators to reach into the box from above. The roof should overhang the front at least 2”–4”, and hang over the sides of the birdhouse by 2”. The sides of the house should enclose the floor to keep rain from seeping into the house and nest. Recess the floor 1/4” up from the bottom to further prevent rotting caused by moisture. Birds are picky about the size of entrance holes on a birdhouse. Before making an entrance hole, learn about the birds you want to attract so you know what size entrance hole your birdhouse needs. Keep in mind non-native species like English house sparrows and European starlings will also take advantage of birdhouses. If you don’t want these birds using your birdhouse, make the entrance hole smaller than 1-3/8”. Before attaching the front of the birdhouse to the rest of the structure, rough up the inside under the entrance hole with sandpaper. This helps fledging birds get a grip when they are ready to leave the nest. Birdhouses for swallows or bluebirds should have grooves under the entrance hole on the inside of the box. The grooves serve as a ladder for fledgling birds. Drainage and ventilation are also important for the birdhouse. Drill at least four 3/8”–1/2” diameter drain holes in the floor of the house. Drill two 5/8” ventilation holes near the top of each side of the house. Galvanized screws should be used instead of nails. 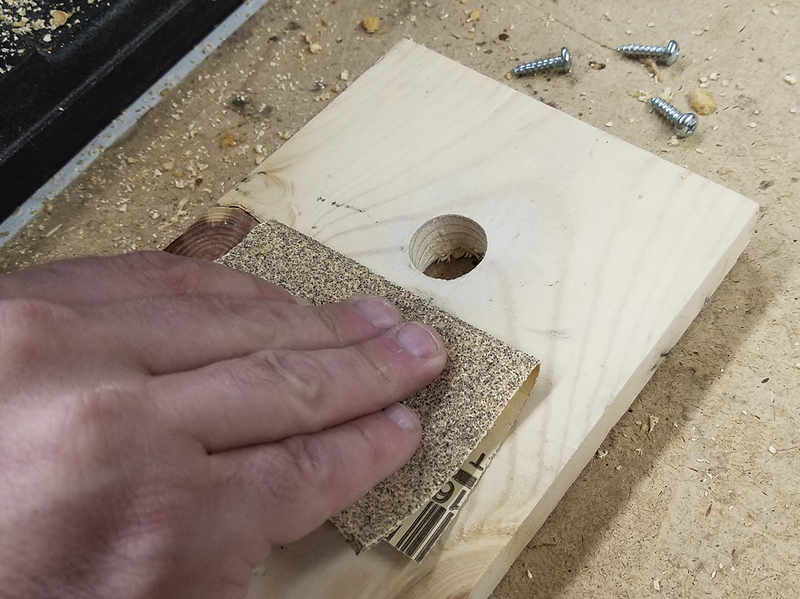 Screws will provide a tighter seal and make it easier to clean the birdhouse or make repairs. Nails loosen over time and can allow rain to seep in. Using rust-proof hinges, add a hinged side or hinged roof to your bird house so it is easier to clean. Did you know raccoons can open a hook and eye clasp on bird houses? Consider another type of latch to keep out these clever predators. Just say “no” to perches. The only birds that really like to use perches are non-native European starlings and English house sparrows. If you bought a birdhouse with perches, remove the perches before putting the birdhouse outside. Can you paint or stain a birdhouse? Extension specialist Catherine Elliot recommends paint or stain preservatives be used on the outside of the box only. Focus especially on the back. Never paint or stain the inside of the birdhouse. Creosote should not be used. The smallest hole an English house sparrow can enter is 1–1/4”. The smallest hole a European starling can enter is 1–9/16”. To avoid these birds, make the entrance holes to birdhouses smaller. Or, be persistent and remove their nests regularly. Eventually the birds will give up. European starlings and English house sparrows are not protected by state or federal laws. You can remove their nests, eggs and young at any time.